The Bedroom. Yes, You Will Be Completed. The Bedroom. The first large room that I will complete and not walk away from due to boredom like the living room (I considered the bath and kitchen small rooms in comparison). So, a weekends worth of work, right? Maybe in an alternative universe. I can do it! Miss Kitty better keep giving me some quality nap time and my husband better not expect a 30 step meal. Gardening season is coming. Gotta get a chunk of this done before the dirt flies! Ok. 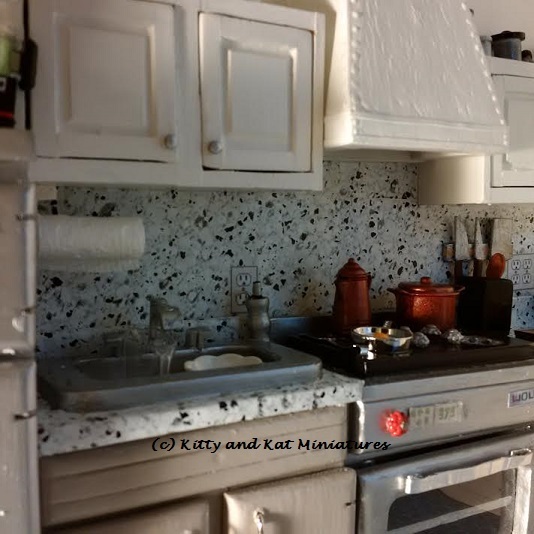 This is the last post about the kitchen. The bedroom is slowly progressing. More to follow! And thank you to the 4600+ people that have viewed my blog since January when I started this. I am blown away. Thank you for all the comments. I'm like a kid on Christmas Day when I see a new comment and I do try to respond in a timely manner. I have a lot of stuff in this little kitchen. Not unlike my own. 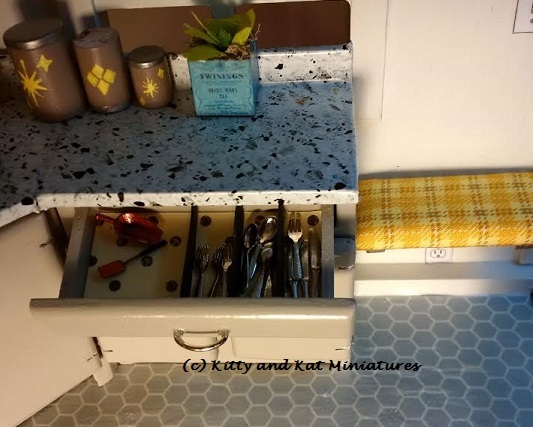 While the cupboards are empty inside, minus a drawer, every other surface is covered. I would hate to have to clean those counters everyday. 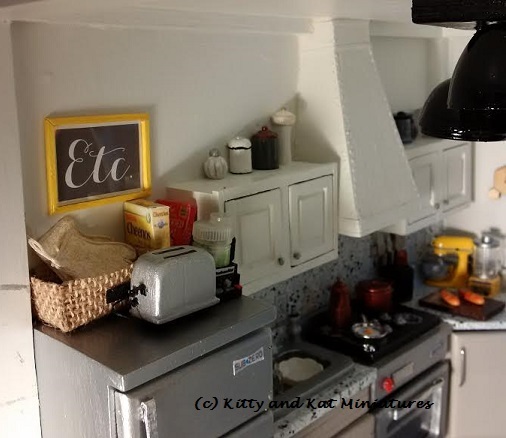 I thought I would run though what I made and what I purchased as I accessorized the kitchen. Whether you care or not, here it is! This started as a full size burlap basket with a chalkboard label. Courtesy of Target Canada liquidating. I determined how big I wanted it and sliced out the basket template. Not easy gluing tiny tabs since the inside has a waterproof coating. The chalkboard label is just a scrap of balsa I cut as thin as possible and then painted black. These are beads topped with regular brass stationary brads for lids. A tiny seed bead was added as the pull. The larger ribbed jar at the rear is actually a cheap marker. It was the right size and the ribbed texture was neat. I sliced the marker, removed the ink strip from inside and started cutting it to the size I wanted. The beads were painted and then sealed with a satin clear coat. I wanted the kitchen to have a jar collection, but no labels. I wanted it simple with no added colour or visuals. I used beads, dowels, some of my marker tube (not the ribbed part), and washers. Everything was painted and then sealed with a satin clear coat. I really wanted a modern clock. On the cheap. I have a thing for hexagons. They look really cool. 2 wants equals a clock! I found laser cut hexagons from Yuhoshop on Ebay. Great service and arrived really quickly. I used (1) 1.5cm, (1) 0.6cm, and (1) 0.8cm hexagon. Glued them together and satin clear coated them. The arms are simple card stock and held together with a tiny nail. I pressed the nail through each arm to make a hole before I drove the nail in. This picture actually shows the other half of the package, the side I used for drawers I forgot to take pictures of. I used the small rectangles and trimmed the edges really tight. Then I sliced off the back ends of the rectangles because they were too long. I then reglued those ends further into the rectangle with Quick Grip to keep the rounded rear, but have a shorter drawer. 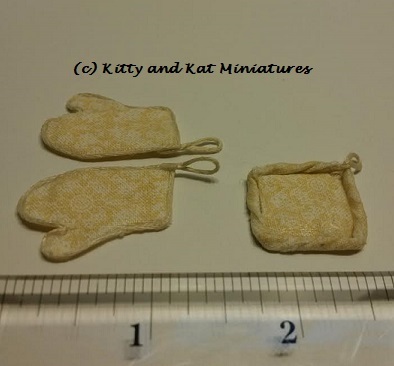 I saw some templates online, but to resize them....well, I just measured my mitts and drew something that looked like and oven mitt. Ditto for the potholder. I cut the oven mitts (4 pieces). I put a bit of cotton batten between then glued the edges shut with white glue. PS they don't open! The trim is embroidery floss I rubbed white glue on to make stiff and sticky then glued it to the edges and made a hanging loop. The trim on the potholder is just fabric tightly rolled and mega glued. Newspapers intrigued me. I didn't think my printer could get the detail. I was wrong. I Google imaged "front page" of the New York Times and The Globe and Mail. Then I put them in Word. 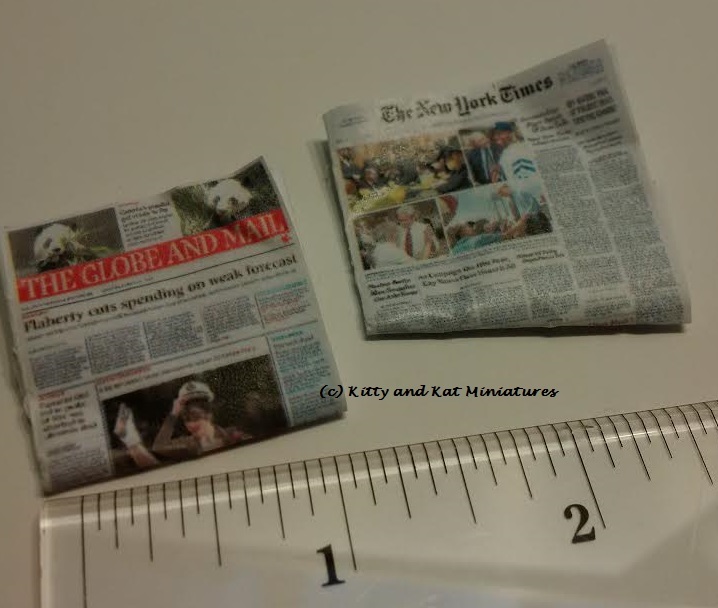 I also Googled the papers correct dimensions too. I then played around to get the right size. I sprayed my newspaper front pages (printed on regular printer paper) with clear satin spray paint. Then I stuffed it with several blank pages and glued the spines. A little crumpling for effect! These canisters started off red and white with cherries. 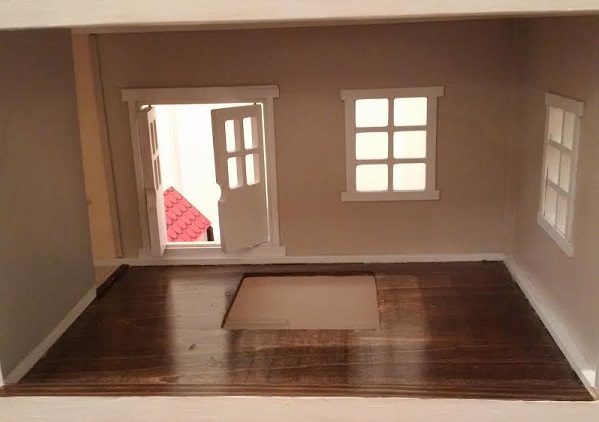 Bought them from The Little Dollhouse Company. 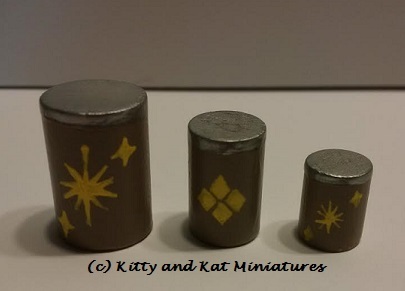 I repainted them grey and did a little atomic themed motif from Alice Volk's blog. Silver paint for lids and clear coated in satin. The paper towel holder was a exercise in thought. I was stumped. So, I thought about the plastic holder I have out in my shed. A simple L shaped arm. I used the scrap plastic bits from the Chrysnbon kits, the plastic bits that hold the pieces you want but then throw out. I found a section that had an L shape bend. I then cut it and glued it into a small wood block. I then wrapped real paper towel around it and glued it tight. No room on the counter, so I had to mount it to the upper cabinet. The soap dispenser was 1 bamboo like bead (see my floor lamp post) and a tiny dowel stuck into it (the pump piece). I used a tiny piece of wire for the "spout" and painted it silver. 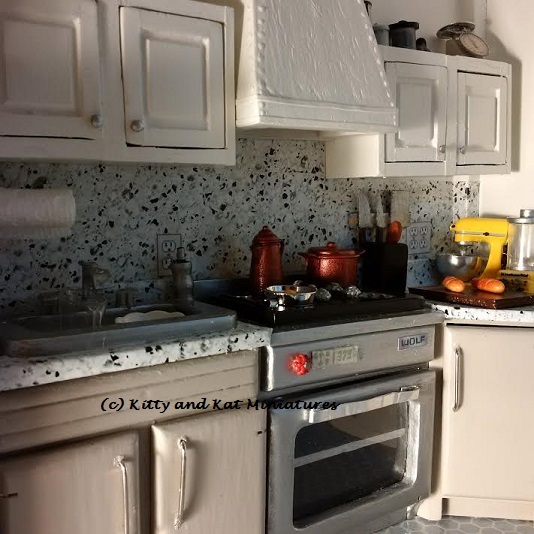 I wanted some permanent fixtures in the kitchen, glued in so Miss Kitty couldn't mess with them. So what better then give a toddler some knives to play with? I carved the knives out of balsa with my scalpel. I tried my nice carving tools, but they were too big. I then used my mini files to get a slant to the blade. The "magnetic" bar behind them is painted balsa. 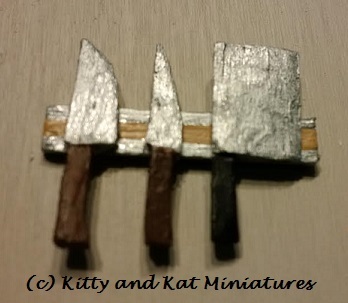 Silver and black paint on the knives, and silver and tan on the holder. Everything was clear coated satin and secured with No More Nails. I wasn't prepared to bust out the cardstock and have a go at making my own. Chrysnbon it is! 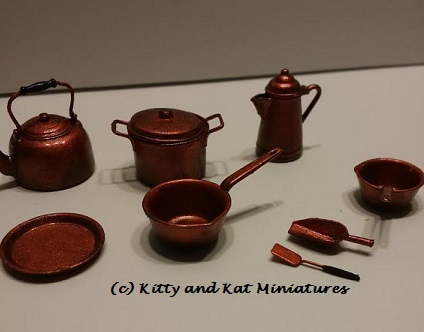 I used 2 types of copper paint.Folk Art "Copper" as the base coat and then dabbed on with a paper towel, Folk Art "Antique Copper" for patina. Then I dabbed black on the bottoms and wherever it might get exposed to flame. After I dabbed on the black, I rubbed it off with my finger to give just a hint of colour. I put wire through all the holes and hung them on a dowel to clear coat them in satin. Again, I used the same Chrysnbon kit as the pots. This time, I wanted a used metal look, nothing shiny. Off to Home Depot! I spray painted them in Tremclad Rust Paint in "Flat Anodized Bronze." I shook it like a martini shaker. However, it spurted out this dry dirt like texture paint half way through my first spray. I didn't panic. I actually liked it. I removed some of the build up with a nail. As you can see, some items are dull and some are shinier and all have a caked on crud look. No clear coat as per the Tremclad instructions. 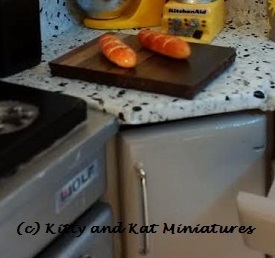 The cutting board started as a laminate counter top sample chip from Home Depot. It was a butcher block chip, so it has different stripes of wood colour. I scored it repeatdily with a knife. DO NOT try to snap it apart unless you can see your score marks on the other side, as you will likely crack the good side. I then mounted it on thin cork from the dollar store and sealed with matte Mod Podge. The light switches and the plugs are from Noni's Crafts. I love them. They are easy to resize and come in 3 colours to suit your room. This little planter came from Minidesign's tutorial and wonderful printies. I printed and sealed the printies with clear satin spray paint before any gluing. I used a 1/2 inch wood block and painted it silver. Then I drilled a hole in one end to place a plant. I then glued and wrapped the label wound the cube. The "plant" is a few faux silk leaves I cut into mini leaves and filled the rest with Spanish moss. I took an approx. 1/2 inch balsa square piece of wood, and cut a 3/4 inch piece off. Then, I used my scalpel and carved out a square hole and finished it with my files. The spoon was my first real attempt at carving! I looks rather nice. I used my carving tools and only shed minimal blood!!! I stained it using those wood touch up pens from the dollar store. The recycling bin was a key chain I had for easily 20 years! Woo hoo for hording! It had a lid that I popped off. It was a recycling bin with no recycling logo. So wouldn't luck have it I found in the dollar stamp bin at Michael's a recycling logo stamp!?! Crazy, I know. I used regular stamp ink, but it wouldn't set, so I sealed it with clear satin spray paint and it worked perfectly. 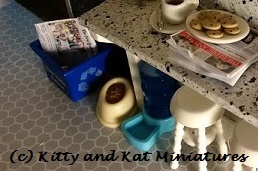 The dog dish and the water dispenser were from the DOLLAR STORE! Holy crap, I nearly jumped up and down when I saw the dispenser. I bought another just for the blue bottle. The dogs, the items, all to scale! I even bought the bunny set. Not the cats, though. Not a cat fan. Sorry cat lovers. I really enjoy shopping with these 2 stores. No issues so far. Both arrived pretty quickly, considering distance and customs. Another great store I used. Wonderful prices and free shipping. Mind you, it took a month to arrive, but there were no issues. I never imagined I would need so much stuff to fill the kitchen in a way that made me feel it was finished! I would like to say that this is the room with the most "stuff" needed, but I have a feeling the attic will top this one. Sigh. 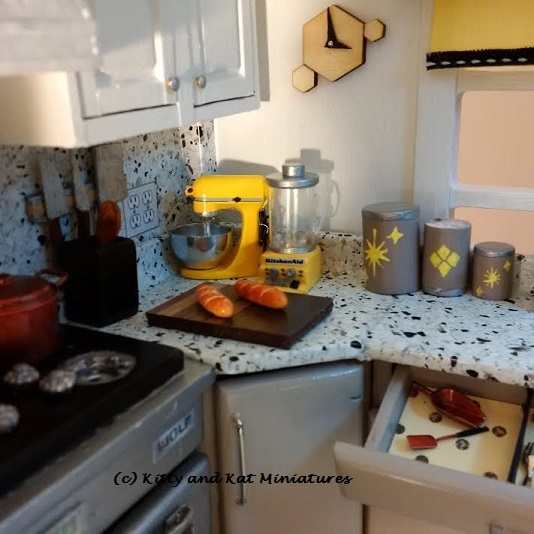 I spent a bit of time working away at my kitchen appliances. The blender, food processor and scale were actually fun to make. It really challenged me (and my patience) to find all the component pieces. I realized I have a lot of stuff in my house that can be mutilated into a miniature. Rather then make a bunch of small posts about each one, I decided to write a mega post about all of them. I will pin each separately for ease on my Pinterest page. This cute little mixer came from Ebay via Fullrich 2009. A great store. There was no way I was going to attempt to make a mixer from wood. I like my fingers too much. 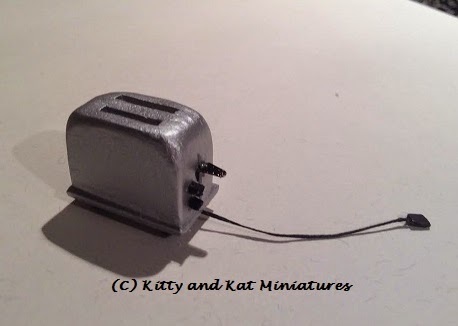 The toaster was an adaptation of Minicrochetmad's tutorial. It was super easy following the instructions, and interpreting the pictures in some cases. I used my Dremel to round out the top edges. Oh so fast! The knobs are slices of tiny dowel and the lever is a piece of bent metal from a tea light sliced up. The legs are just larger seed beads. The cord is glue stiffened embroidery floss and the "plug" is cardstock. The whole toaster got 2 coats of Mod Podge gloss to seal it. I got the scraps of stuff together to make the blender and really had no clue where to go from there. Then I found the Doll Diaries Blender Tutorial. It was intended for American Girl dolls, but it was simple enough that I could shrink it down. You know when you just need something that looks close and feasible to inspire you? This was it. I used an old plastic tube that was a container seed beads came in. If you're Canadian, think WAY back to Lewiscraft. That's what the price tag said. It might be 30 years old. Thanks mom! 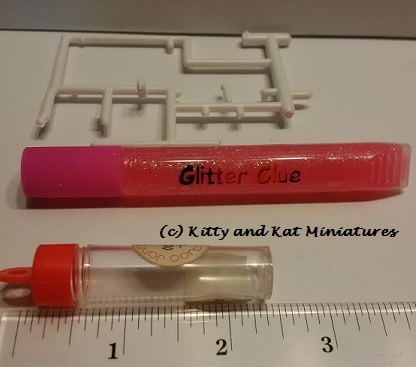 The glitter glue is a tube, but its soft and mushy, perfect to slice for a handle. The base is a 1.5cm by 2cm deep by 1cm tall. It was a 1/2 inch block I just sawed down. I then used my file to round off the sides and the top corners. The face plate is 2 pieces of balsa. 1 piece holds the knobs and extends the full length of the cube, but not as tall (the gap is where you put the Kitchen Aid sign). The knobs attach to this part, which were slices of tiny dowel. The round front piece was rounded off using a file. The buttons are scrap balsa cut as thin as possible. The 2 face plates extend from the base cube a total of 5mm. The total height of the blender is 1 1/4 inches (3.5cm). The plastic tube is just under 2cm in height and 1.3cm in diameter. The "blade" inside is a clear plastic bead that looks like a snow flake (sort of). Its a cheap plastic kiddie bead, nothing fancy. Check the dollar store! The lid is a button. The stopper is a round thing that is button like, but had no holes. A bunch came with the bag of dollar store button I purchased. A slice of dowel would work just fine too! 3mm tall and a 5mm diameter. The handle was tricky! I used the glitter glue plastic and sliced off a piece. It does bend but, its a little bit stiff, so try bending and gluing that. Didn't work. So, I took the strip and scored it closely so it would bend easier (the scores are on the inside). I glued each end separately with Quick Grip. The cord is embroidery floss I stiffened with glue. I then poked a hole in the blender and jammed the thread in. The "plug" is a piece of cardstock. The yellow base and the lid all got 2 coats of Mod Podge gloss to seal it. The Kitchen Aid label was via Google images. Find a tiny one first, its easier to make smaller because the resolution is likely better. The greatest best mistake I made! The mixer was supposed to be the blender. That is, if you had a stunted blender that wouldn't hold more then half a smoothie at a time. It also started as the Doll Diaries Blender Tutorial. But if you cut your plastic tube too short it becomes a food processor! Winner winner chicken dinner. 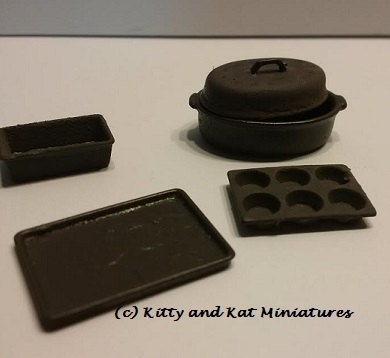 It measures 1.5cm wide by 2cm deep by 1cm tall (just the base). Total height is 2.7cm. The wood block and face plate follows the blender (see above). but the 2 pieces that hold the knob and buttons extend out only 3mm in total. The knob is a slice of tiny dowel and the buttons are balsa scrap cut as thin as possible. The plastic tube body is a seed bead tube, like the blender, but I used the screw top end to look more like my food processor. It's 1.cm tall (excluding the feeder) and 1.3cm in diameter. The small circle on top is the "feeder" where you feed in food as its spinning. I used some plastic from a mechanical pencil, but a straw could work too. Its 7mm in diameter and 3mm tall. The handle is required some thought. I ended up using the left over scraps from the Chrysnbon set (see above picture with the glitter glue for reference). I cut it and rounded the cut edge with a file. I then painted it black and glued 2 seed beads to it. Quick Grip held it together nicely. I then painted the seed beads silver. The blade inside was the same bead used in the blender, also painted silver. The "food" inside is green painted kosher salt. The cord is embroidery floss I stiffened with glue. I then poked a hole in the processor and jammed the thread in. The "plug" is a piece of cardstock. The wood and handle both got 2 coats of Mod Podge gloss to seal it. The scale was never on my radar until I got on a small appliance role. 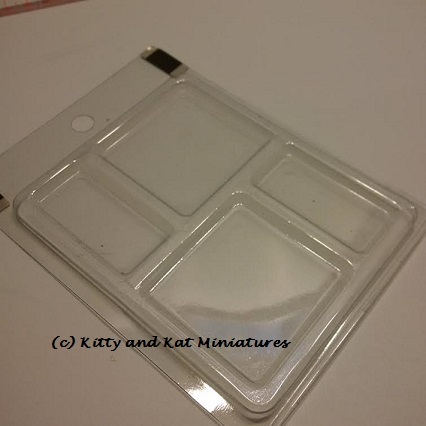 Ebay didn't reveal anything I liked, so I decided to make one myself using real life scale pictures I found on Pinterest. The wood base is 1.5cm wide by 1.3cm deep. The actual rectanglar body piece is 1cm wide by 1.1cm deep by 1cm tall. The top of the triangle is flat because that is where the round disc components attach into. The scale face is 1.3cm in diameter. What's with all the odd measurements, you ask? Well, I didn't really measure as I went so I didn't notice until I was typing and measuring! The bases edges were rounded off using a file. It was then glued to the triangle and the gap willed with wood filler and sanded smooth. I then painted it "Gray Wolf" by Marth Stewart (craft paint). The scale face is elevated using a small slice of wood dowel painted silver. The scale face was taken from an image of a real scale, just shrunk down to work in scale. I sandwiched it between 2 pieces of ridged plastic packaging I took out of my recycling box. I trimmed the whole face with silver paint. The paint hid the tiny dots of Quick Grip glue I used to stick it all together. The scale top is 1.5cm in diameter. It is used as a jewelry pendent, you would glue something to it. I snipped off the metal loop. Found 20+ in a pack for $3 at Walmart. It sits on a 1.5 cm long strip of egg carton. I tried wood, but it split every time I tried to put the metal supports through it. The 2 metal supports are metal head pins you would use in earring making. It has a flat blunt end not a loop. The pins went down through the egg carton strip and into the tiny holes in the base. Strip plus pins are 4mm tall. The strip and pins were all painted silver. Everything (minus the face) was given 2 coats of Mod Podge gloss. 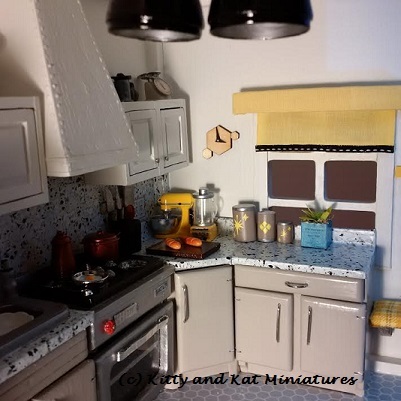 The stove was from the economy kitchen set from The Little Dollhouse Company. It was white and blah blah bland. It met its day with 2 coats of medium grey base coat and 4 coats of silver. I left the inside white. 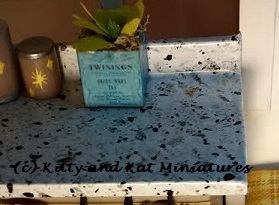 The top was painted black, and I added new knobs on the top with beads and nails. It beat the gold nubs they called knobs. And I made the burners silver too. I wanted a designer stove. So, I Google imaged the Wolf stove logo and slapped it on. I made the red knob that Wolf stoves have with a bead and a nail. The "digital" display is just white cardstock with arrows and 375 degrees painted on in a pale green paint. A piece of scrap plastic was applied over it. 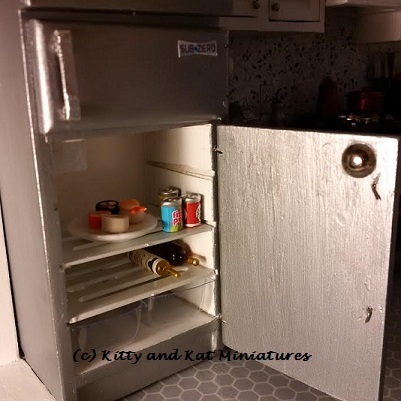 You can't have a designer stove and not a designer fridge! Only the best for Miss Kitty. Again, I Google imaged the Sub Zero logo and Mod Podge'd it on. Tip: Find a tiny logo image. I find them clearer and easier to shrink down further in Word. The fridge wouldn't stay closed when it was installed. My floors weren't even I guess. And an open door is waaaay too tempting for a toddler to rip off, so I devised a plan. I used a tiny 5mm magnet as a closure. I was scared to use it with a little one, so I made up a sealed compartment. In the picture (left) you can see a silver square in the top left corner. Its a square piece of balsa. I drilled out just enough space that I could push the magnet deeply into the wood and it be snug. No More Nails adhesive was applied behind the magnet too. I then took a piece of metal from a tea light and cut it the squares size. I used No More Nails and glued it over top the magnet. The magnet was now sealed away. The cube was glued in the corner using No More Nails. On the door I both nailed and glued on a upholstery tack. The door is now tough to open! I win Mr. Door! There you have it! The appliances are done, done and done. I hope I was clear. If not, just ask away in the comments and I will try to clarify or send you an additional picture to help you along. I hope you enjoy my kitchen! Its the first kitchen I've ever made, so I'm still learning and refining, but I think it looks pretty good. First, I think I deleted the one good overview shot I took. Deep breath. Pause. So, you get to see the sectional shots. Second, one of my canisters is upside down. Realized that the day after. I was tempted to set it all up again, but I thought, no, control your OCD and move along. All in, the kitchen took 1.5 months of evening work, anywhere from 8pm to midnight. I am pleased with the results. Did a little happy dance when it was all finished. But, then I took everything removable out, so it is once again a cute but empty shell, ready for toddler hands and pint sized dolls. I used both my Canon Rebel T4 and my BlackBerry Classic to take the photos. Cellphones are awesome for getting into tight places. The accessories and the appliances will be all broken down and explained in subsequent posts. I didn't want to bore you to death in one shot. I prefer it slow and painful for you!